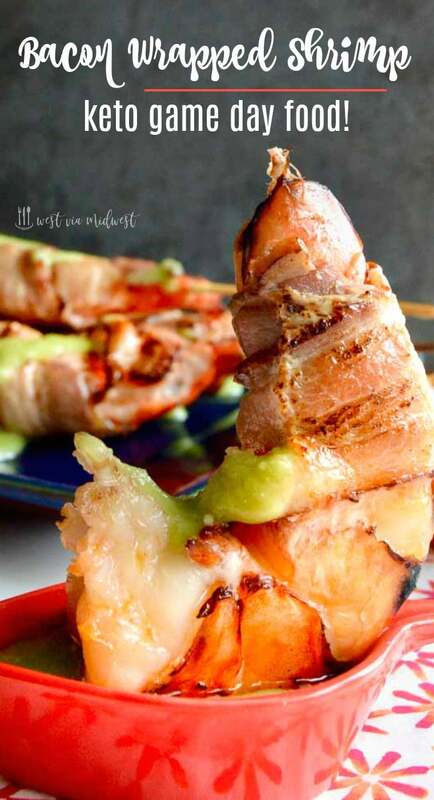 These Bacon Wrapped Shrimp with Avocado dip are 3 bite appetizers that will go quickly at any party! 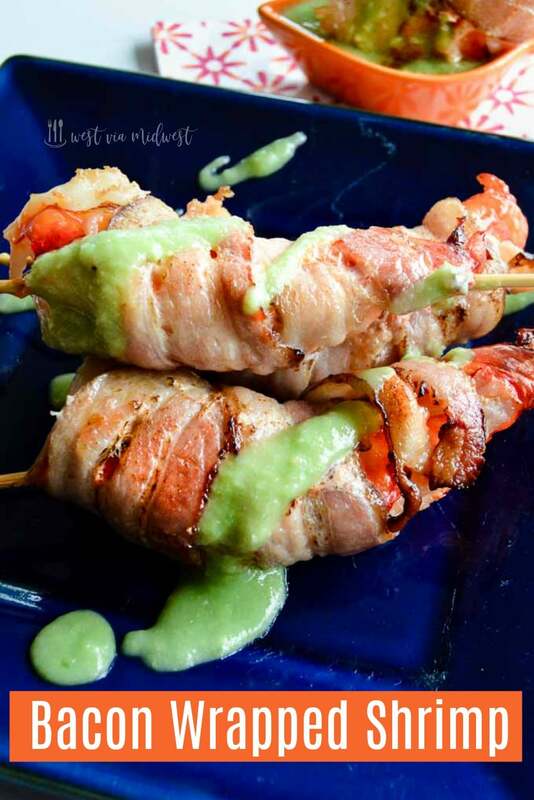 Succulent shrimp, wrapped in bacon broiled to perfection then served on skewers with a healthy avocado salsa which is reminiscent of the Avocado Salsa served at El Pollo Loco! 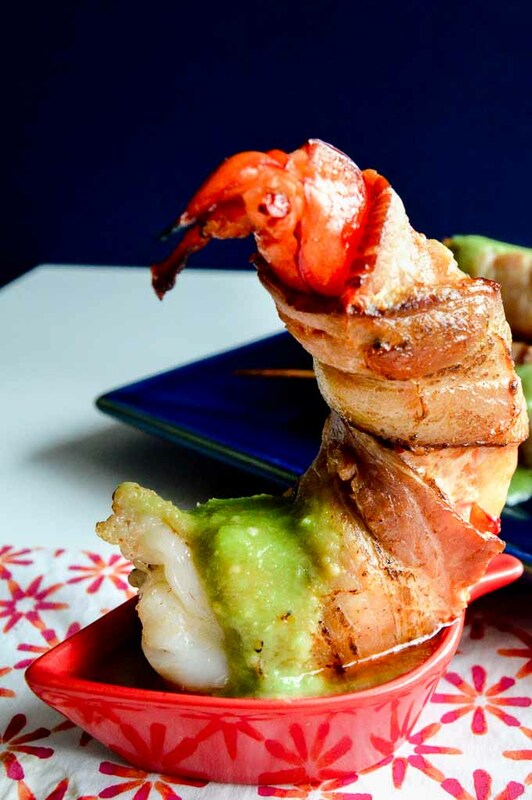 These Bacon Wrapped Shrimps with Avocado dip are no ordinary shrimp appetizer. These are the ultimate shrimp appetizer for game day or as an elegant appetizer for Valentines day. I digress, back to the healthy shrimp. Bottom line, I LOVE FOOD. So if I’m eating healthier foods, the food still has to taste great. 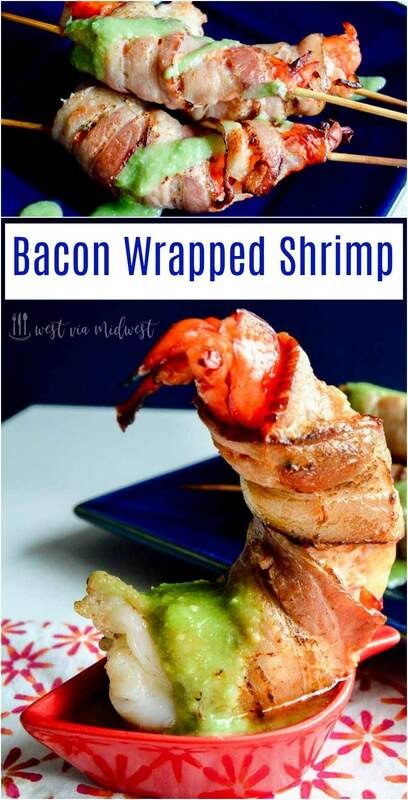 Today’s recipe for bacon wrapped shrimp is something you’d never think of as a diet food yet it fits all the diet plans like keto, gluten-free and whole 30. Shrimp is low in fat, carbs and calories. (That’s a WIN in my diet choices!) They do have higher cholesterol numbers so be sure and eat a balanced diet to account for that but all in all shrimp is a good pick when trying to make better choices. 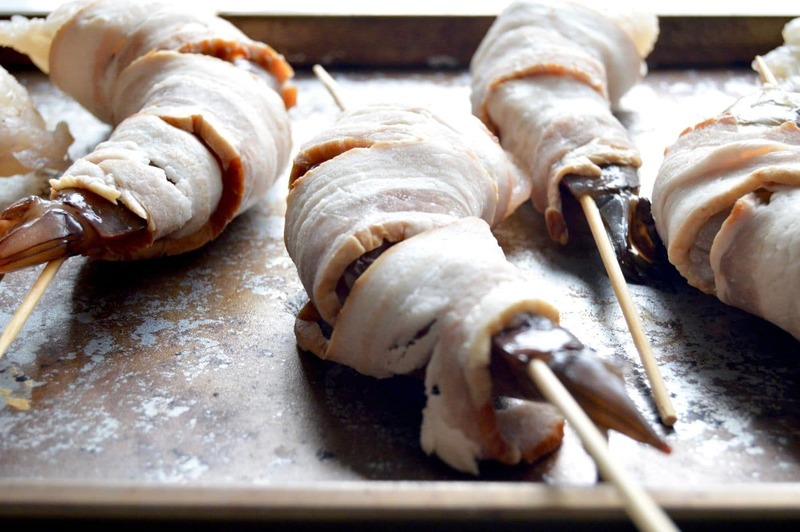 Two colossal shrimp wrapped in bacon have 19 grams of protein and are only 147 calories. How to save money when you buy shrimp? What the heck is a prawn, and is it a shrimp? We love shrimp, but it can get expensive. How to save money on shrimp you ask? Buy it when it’s on sale and throw it in your freezer. Unless you live by the ocean even shrimp marked fresh shrimp has been frozen. Even if you see it thawed in the seafood counter I guarantee you they thawed it from a previously frozen state. PRO TIP: When the size shrimp you want is on sale, ask the seafood counter if they have some that are still frozen you can buy. Even if you want to eat the shrimp that night, they defrost quickly. By buying them already frozen you can always have a bag in the freezer ready to go when you need them and not have to pay full price for them! For this shrimp appetizer recipe I suggest buying the largest shrimp you can find for entertaining. It’s less work and the presentation looks so cute with the larger shrimp! Shrimp comes in all sorts of sizes. When you go to the market they will be called any number of names such as jumbo, colossal, small…. (see the chart below.). When you’re at the seafood counter where the price is you will see a note that says U- with a number. This number is the unit count you can expect to get per pound. 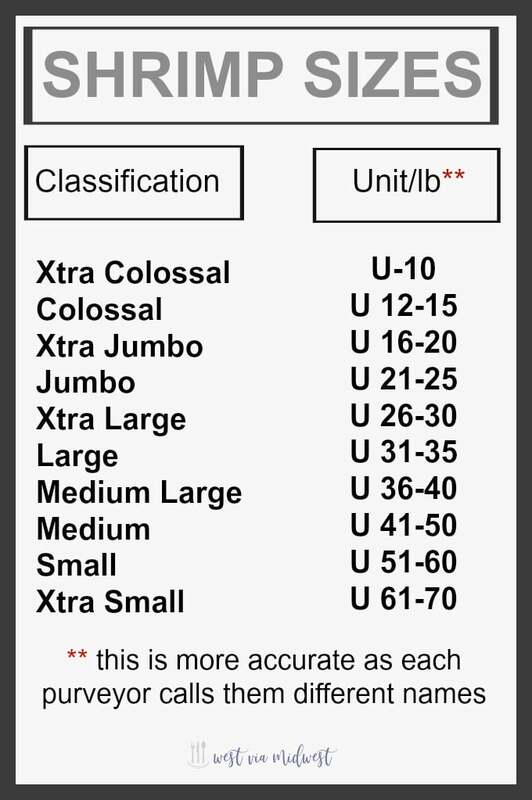 The smaller the U number the larger the shrimp. I suggest when shopping you use this versus the name as it’s more accurate. The name classification can vary by the source of the seller. You’ll also notice I don’t have a prawns classification on that list. The reason is technically prawns are not shrimp. Both prawns and shrimp are crustaceans and look somewhat similar but there are some differences. Prawns tend to be more expensive, and are larger than shrimp and are often served at fancier restaurants. The good news….. they cook the same so if they have prawns at a price you’re willing to pay you can substitute in any recipe that calls for shrimp. The cooking time may take a little longer if it is a very large shrimp and your recipe calls for smaller shrimp, but cooking them to the correct doneness is easy. How to prepare bacon wrapped shrimp. Buy the largest shrimp you can afford. Smaller shrimp work just as well but I like to save the time of doing the smaller shrimp versus the large. Did I just lose you…. the word devein used to send me to the moon it just sounded so awful. If you don’t have an issue with cleaning the back out I promise you its super simple to do. PRO TIP Save the shells in the freezer if you make bouillabaisse or anything else you might need fish stock for. You can just drop them in a zip lock back and freeze them until you are ready to make them. It’s as easy as adding a small slice of onion, pepper, a carrot with the shells and boiling them for about 10 minutes. Strain then allow to cool. Homemade has never been so easy and it’s basically free since they were leftover from the shrimp. 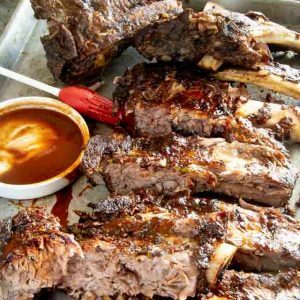 Did I mention how much better homemade is without all the preservatives that you get with store-bought? Using regular bacon (you don’t want to buy the thick cut for this recipe) cut each slice in half length wise. The thinner bacon cooks faster. If you buy thick bacon there is a chance your shrimp will be in the oven too long to guarantee the bacon is completely cooked. Slide the shrimp onto skewers. Not only does it make them easier to serve but the shrimp also will stay longer and straighter if you use a skewer. I got these shorter metal skewers as a gift and I just LOVE how easy they are to clean and how easily the shrimp slides off when you are ready to eat them! You can also use wooden skewers like the photo shows. You place them on a baking sheet to broil like this…..
Place the tray in the hot oven and cook until the bacon is browned and the shrimp is an opaque white color. The size of the shrimp dictates the time you will cook it in the oven. I’ve given an estimate but you’ll want to stick close during the baking time to check them! I usually make the salsa while they are cooking because the Avocado Salsa takes no time at all to whip up. 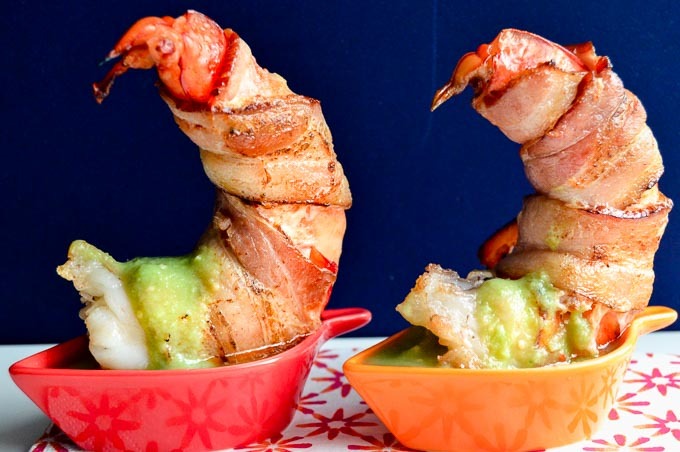 For purists, they might not want the Avocado dip, and thats ok. Shrimp wrapped in Bacon is pretty spectacular on its own! But for those that like a slight extra kick… this Avocado Salsa, which is copycat of the avocado salsa they serve at El Pollo Loco, is a great pairing. Easy/Hard: Easy…. All there is too it is wrapping the cleaned shrimp and broiling! Healthy: Yes! Under 180 calories for each serving, buy sugar free chemical free bacon and you have Whole 30 Compliant and a Paleo option! Naturally GF too! Keto too! 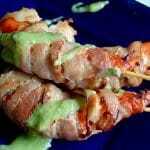 Bonus: These Bacon Wrapped Shrimp with Avocado Dip are great served hot, with the cold dip on the side, but they are equally as delicious serving them cold! So if you are pressed on time, these are a great option for making ahead! Alternative suggestions: If you have fresh scallops available this recipe will work with scallops too! This Avocado dip works with just about anything! Chips, salad dressing, a sauce on a burger or drizzled over grilled veggies! Other dipping sauces: Use a Marinara Sauce or bbq sauce if you want something more traditional! 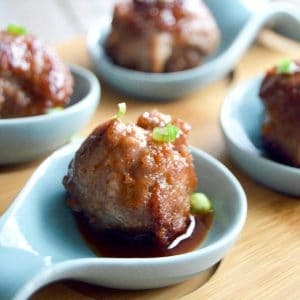 If you enjoy these Bacon wrapped Shrimp with Avocado Dip you might enjoy these Retro Shrimp dishes : Spicy BBQ Shrimp, Bacon Sugar Smokies or these Bacon Wrapped Meatballs . Large, succulent shrimp, wrapped in smoky bacon cooked perfectly on skewers. 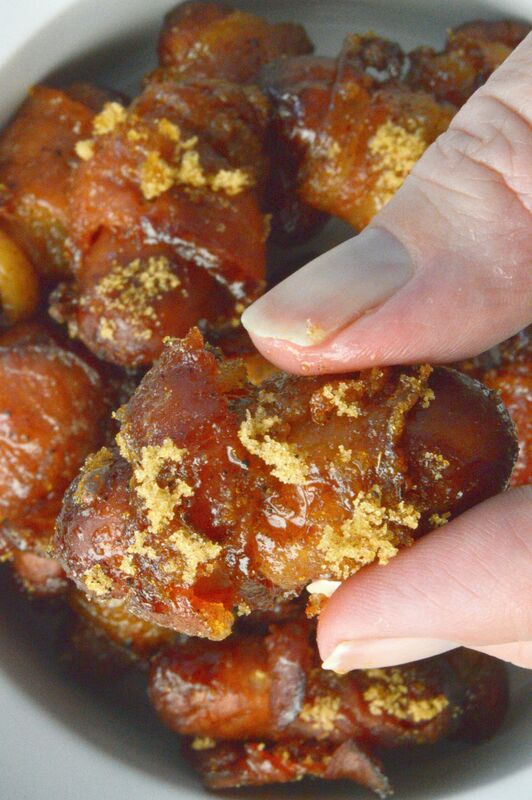 Place Skewers on a baking sheet and place in oven for 20 minutes, flipping at 10 minutes. At the end of 20 minutes raise oven to broil to crisp up bacon for one last 5 minutes of cooking. All ovens are slightly different. Shrimp should be white and no longer see through when done cooking. While bacon/shrimp are cooking make avocado salsa to serve along side as a dipping sauce. (recipe below). Serve immediately upon removing from the oven. 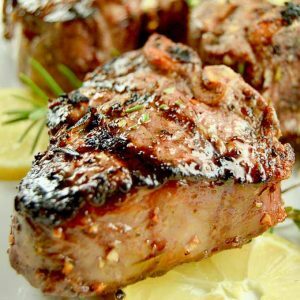 Calorie information for this recipe was calculated by using the specific brands that I purchased to make the recipe and was formulated by using My Fitness Pal's database. If you are following a strict diet, please calculate your exact ingredients, because nutritional information varies by the exact products you purchase. Avocado made into salsa. Light, refreshing and perfect for so many meats and chips! Place all ingredients into a food processor and blend until smooth. Keep refrigerated in a sealed container for up to 3 days. Can be made ahead. Shrimp is one of my favorites! These appetizers are amazing! The bacon totally gives it a great flavor! Holy smokes!! These look amazing!! I LOVED eating at El Pollo Loco when I lived in California!! You had me at bacon wrapped shrimp and hooked me with avocado salsa! Oh hello! These sound and look so delicious. 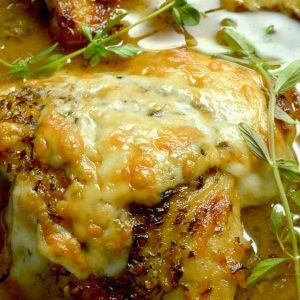 This is my kind of low carb comfort food! I loved this! Really gorgeous and perfect for entertaining! SO good and that avocado dip is just perfect! I don’t get to el pollo loco as much as I like too… this salsa is the best!! You had me at avocado salsa! Great pictures as well!